The purchase of the truck was made possible through a grant from the Saint Luke’s Foundation and individual donations raised through a grassroots social media campaign. Additionally, U-Haul of Cleveland made available the best possible vehicle for purchase, and was most supportive in taking steps to ensure that the “like-new” truck would meet the Division’s needs. 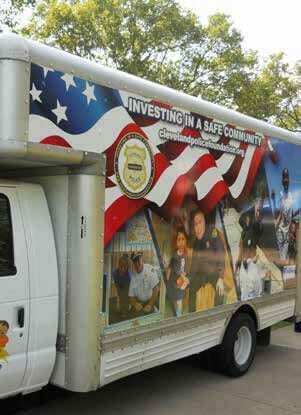 Local firm HKM Direct Marketing Communications lent their expertise to have the truck “wrapped,” emblazoning it with the messaging to make it the “traveling road show” the CPD desired in order to communicate its mission. In June, a reverse raffle was held to pay for the finishing touches and equipment needed to get the truck ready for rolling into the neighborhoods. That night, with the supports of Mike and Sharon Hargrove, who raffled off their suite at Progressive Field for an Indian’s game, the project was successfully 100% funded. Thanks to all who made this a reality, and for helping our officers to be able to more effectively perform their community outreach activities.